Almost 10 years ago, a friend gave me for Christmas the French Laundry cookbook. This was the book which, with all its pretty pictures and wonderfully written commentary, was largely instrumental in inspiring us to embark on our culinary adventures. For years we could only hear and read about others' experience at the French Laundry, having no other ostensible reason to travel halfway around the world for a meal (and if we did, we could not secure a reservation), and yearn for the day when we will have the chance to eat there as well. 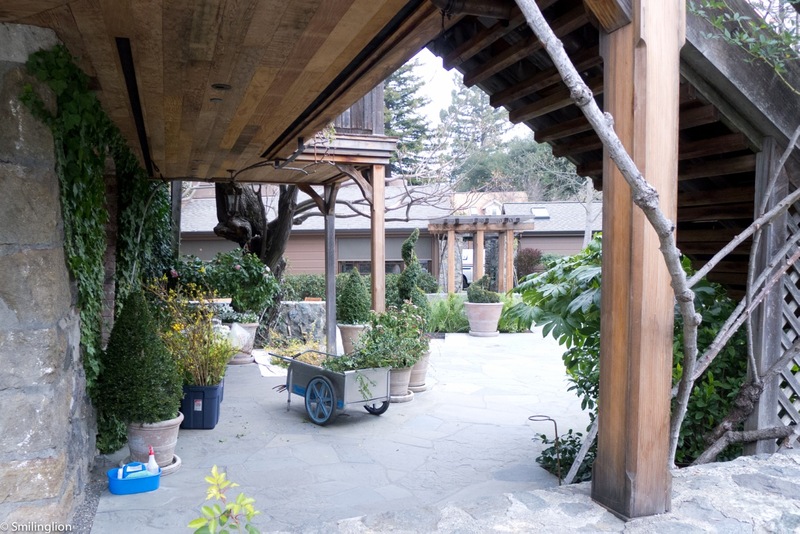 At the turn of the century and for a few years afterwards, Chef Thomas Keller's French Laundry was one of the restaurants primarily responsible for putting the US on the global fine-dining map. 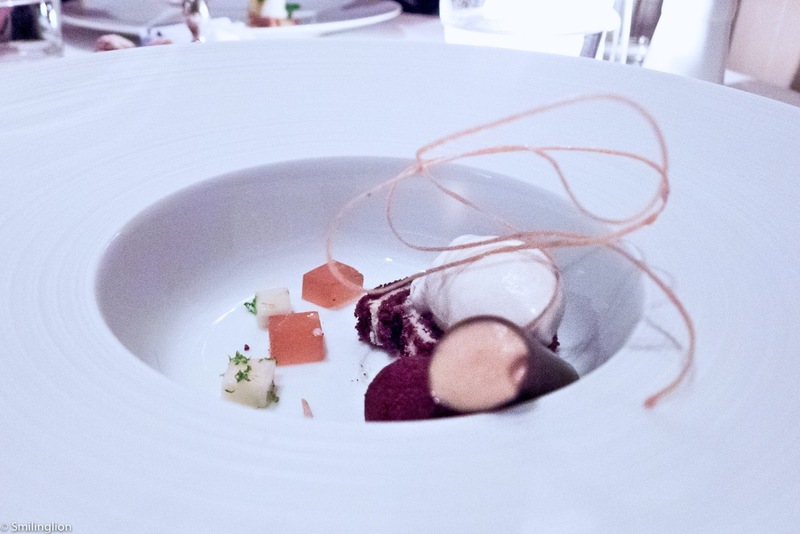 But when Chef Thomas Keller opened Per Se in New York, his new restaurant seemed to take much of the attention away from his original setup in Yountville. To a large extent, our trip to New York in 2012 to eat at Per Se satisfied much of that obsession, but despite that, we were still very thrilled when we finally secured a reservation at the French Laundry this time round. 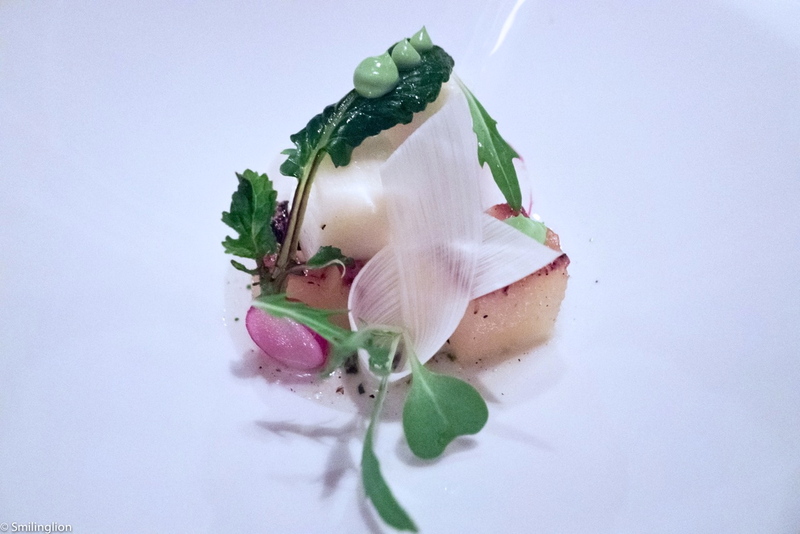 We were quite apprehensive that, having been blown away during our dinner at Per Se a year ago, the French Laundry would disappoint us. This is even more so because the Chef de Cuisine, Chef Timothy Hollingsworth had recently announced his departure and was staying on till his replacement, Chef David Breeden from Per Se, arrived to take over. We did not know what to expect given the changes in management in the kitchen. 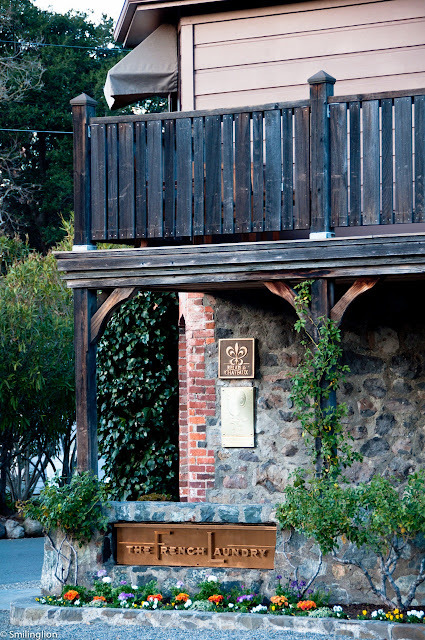 The French Laundry is in a standalone building just off the centre of Yountville town. It was originally a french laundry (which is where the restaurant got its name) before being converted into a dining establishment. 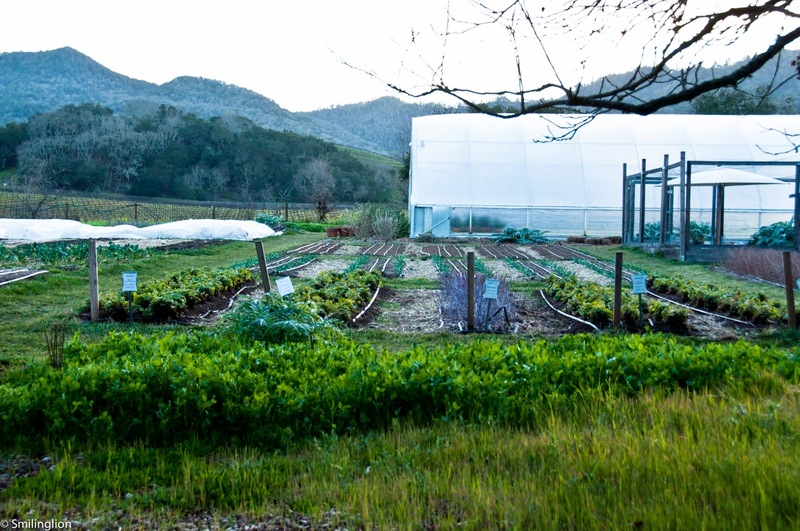 Just across the road is a plot of land which the French Laundry uses to grow some of its fresh vegetables. The interior of the restaurant was as rustic as it looked from the outside. A small waiting room (too small in our opinion) opened up into a warm and cozy dining room (with another dining room on the second floor). 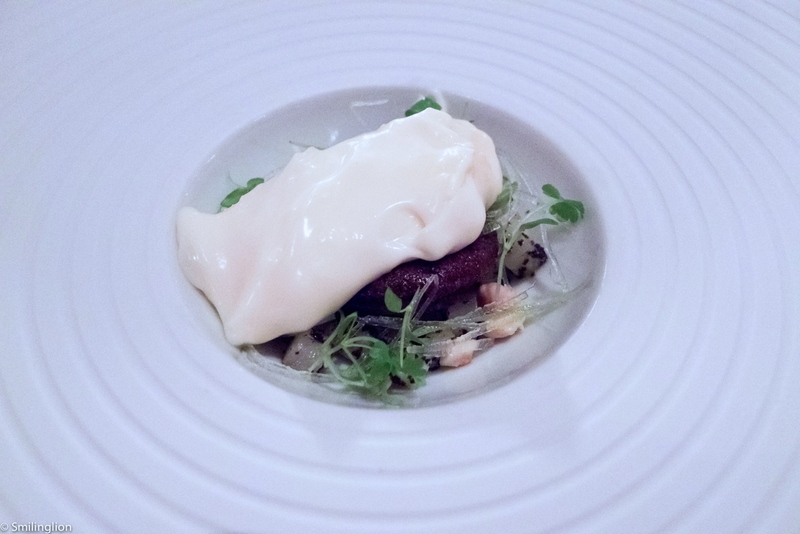 There were two menus on offer: the French Laundry degustation and the vegetarian menus, and we took the former. Curiously, we were surprised by how expensive American wines cost in California. 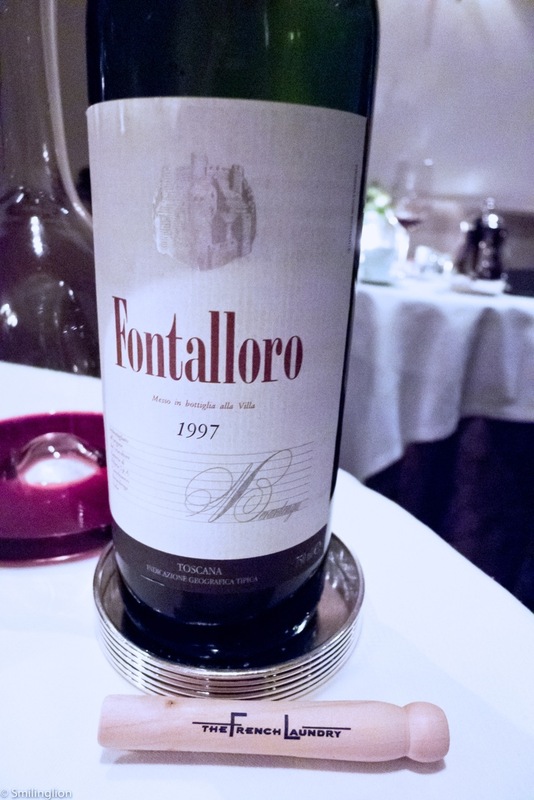 Typically when we are dining in a country, we will drink the local wines but in the case of the USA, we found the American wines almost prohibitively expensive, especially in the better restaurants. In fact, very often, we found better value (relatively speaking) in the European wines. 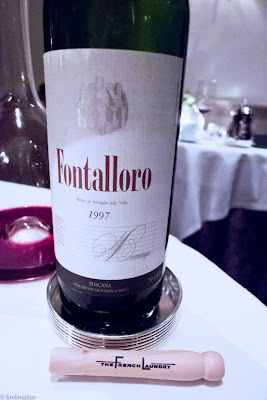 That night, we picked a Super Tuscan (Fontalloro) of an excellent vintage (1997) at a price which, though not cheap, was less dear than American wines which we thought weren't as good. Forgetting how much we actually paid for it for a moment, it was actually a wonderfully mature and sophisticated bottle of claret. 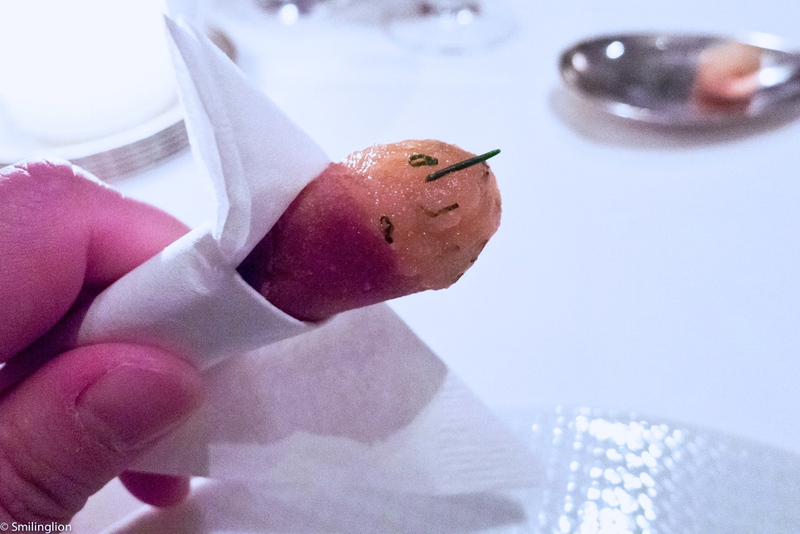 The salmon cone was a classic French Laundry amuse bouche. "Oysters and Pearls" - "Sabayon" of pearl tapioca and Island Creek oysters and white sturgeon caviar: One of the classic French Laundry dishes, this was every bit as amazing as the one we had at Per Se. 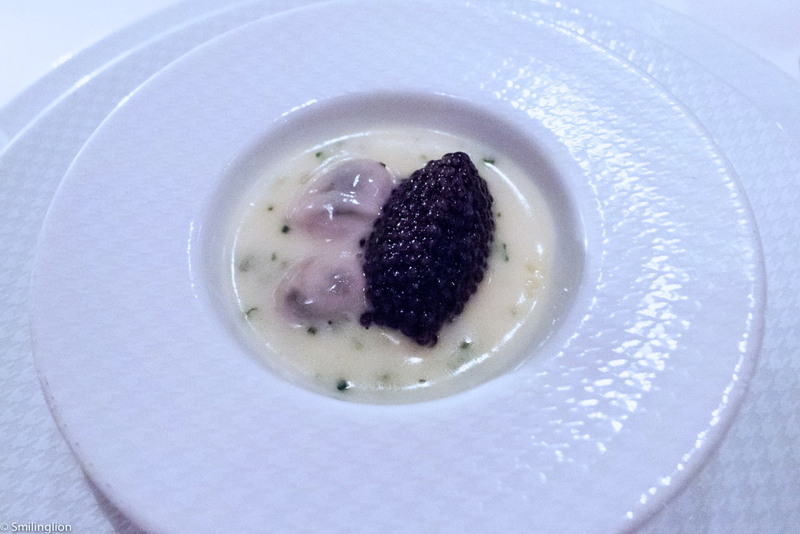 Somehow the starchy base with the briny oyster and caviar could conjure bliss for us when we ate it. Salad of hearts of peach palm - charred golden pineapple, young coconut, radishes hass avocado and mizuna: A simple salad, it was light, refreshing and well put together. Hawaiian big eye tuna - pickled "Hon-shimeji", Tokyo turnip, gingko nuts, chilli, komatsuna and yuzu cream: This was the 'special' of the day (it was 'tuna day' at the French Laundry). We generally don't like tuna unless it's the premium parts like the belly, so this was nothing something to rave about. Sweet butter-poached maine lobster tail - Nantes carrot, Vidalia onion ring and pea tendrils: The next dish absolutely wowed us. The lobster (unfortunately hidden under the large onion ring in the photo) was gently poached to perfection and it was so tender, juicy and sweet. It was an amazing dish. 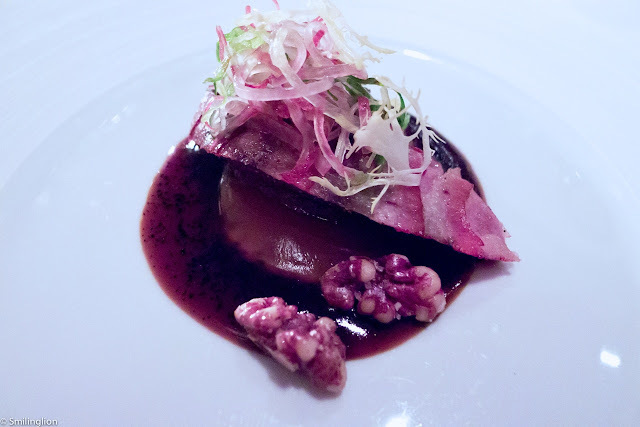 Wild Scottish wood pigeon - Hobbs' bacon, winter chicories, Royal Blenheim apricot, English walnuts and sauce "Perigourdine": Another great dish, made perfect by the flawless sauce. 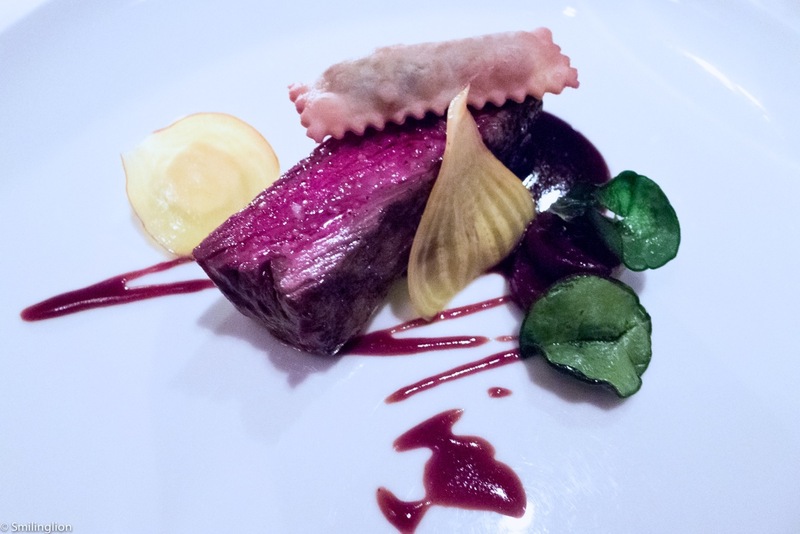 Snake River Farms "Calotte de boeuf grilllee" - brisket "Barbajuan", heirloom beets, Caraway creme fraiche, swiss chard and sauce bordelaise: An amazing cut of beef, it was gloriously flavourful without being too fatty. Jasper Hill dairy "Winnemere" - "Pruneaux d'Agen" cake, celeriac salad, Piedmont hazelnuts and black truffle: The 'cheese course' was the soft stinky cheese which we had come to love in the US (reminds us of a combination of the epoisses and the munster french cheeses). We thought this was one of the more enjoyable composed cheese courses. Star ruby grapefruit "float" - "Pain d'Epices" and marshmallows: This soda float reminded us of our childhood, but with the added delight of the layer of spice bread and marshmallows. Passion fruit "Swiss roll" - Valrhona chocolate cremeux, caramel mousse and banana ice cream: We loved the deconstructed swiss roll, especially with the combination of chocolate, caramel and fruits. Bakewell tart - Fuji apple compote, "Pain de Gene" and toasted oat "glace": Another deconstructed dessert, this was also very light and delicious. 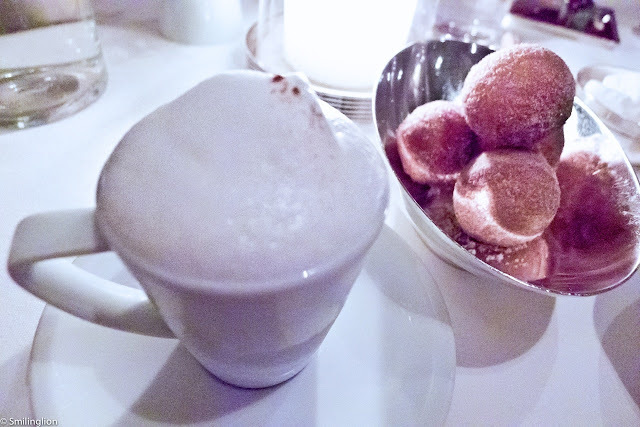 "Coffee and donuts": Another familiar favourite, the 'coffee cream' and donuts were a great end to an equally great meal. 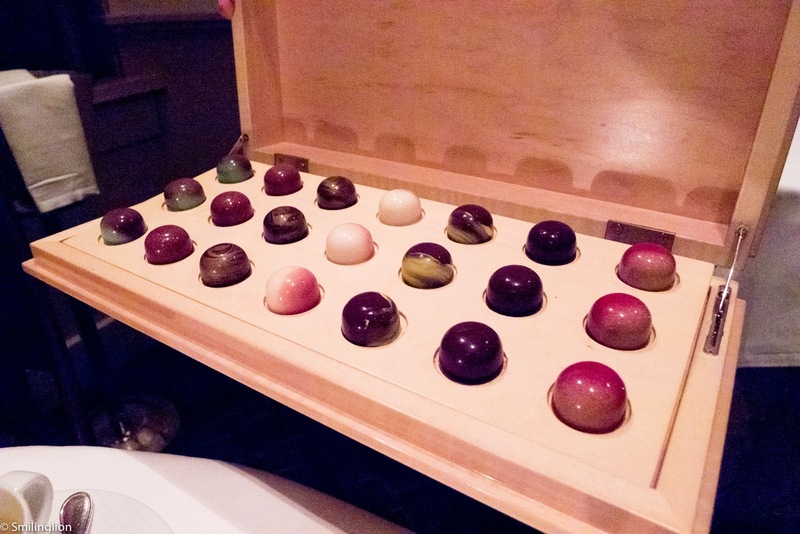 And if we weren't full enough, the obligatory box of chocolates showed up tempting us to eat even more. Despite our lack of appetite by that point, the chocolates were so good that between the two of us we tried every different kind offered. Impressions: Our friends asked us which was better, Per Se or the French Laundry. Our answer would be that both were excellent dining experiences but in different ways. The French Laundry had a more rustic feel about it, and was more casual (both in terms of service and ambience). Food-wise, we actually preferred the classic dishes here than at Per Se, yet Per Se probably had a better culinary range. We were very well taken care of by the staff, and were even given a tour of the kitchen after dinner. 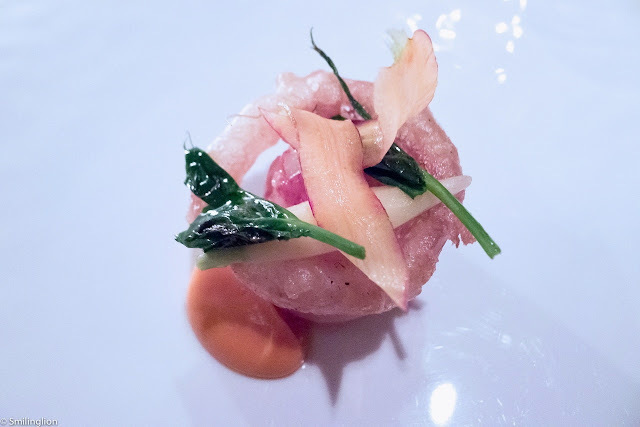 In many ways, our reservation at the French Laundry was supposed to be the highlight of our trip (as securing the reservation was the primary reason we had planned a two week holiday in California), and it did not disappoint. and here I am still reading about others' experience at the French Laundry. I am inspired to make a trip across the Atlantic now. You most definitely should! Yountville is such a charming little hamlet yet with so many great dining options.. 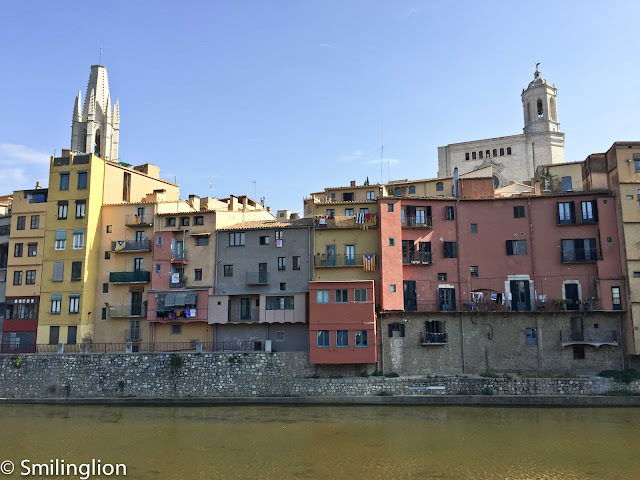 The dining experience generally differs from country to country so it's actually quite hard to compare dining in, for example, Paris (which is often a grand affair lasting up to five hours) to the US or even other places in Europe. We certainly enjoyed the meal very much and all the key elements to the meal (i.e. 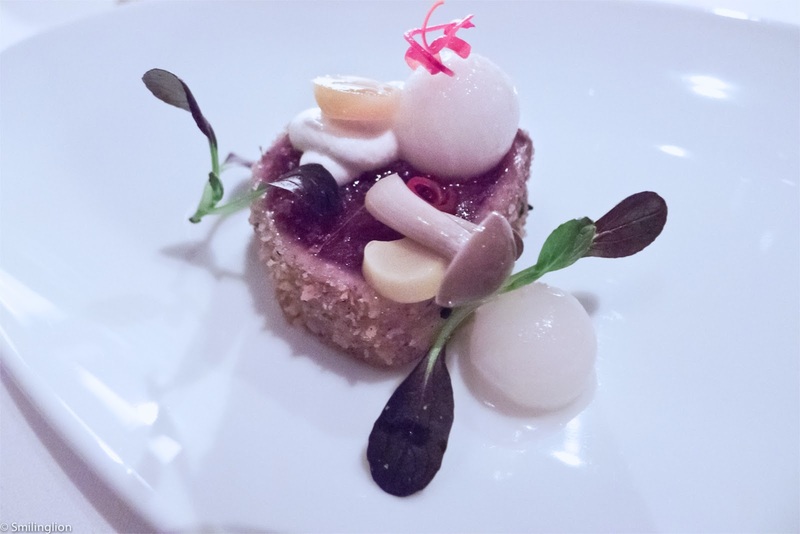 quality of cuisine, level of service, winelist, dining rom ambience) compared favorably with those we have experienced in other parts of the world (including Europe), so yes we think that it certainly belongs up there with the best of them. 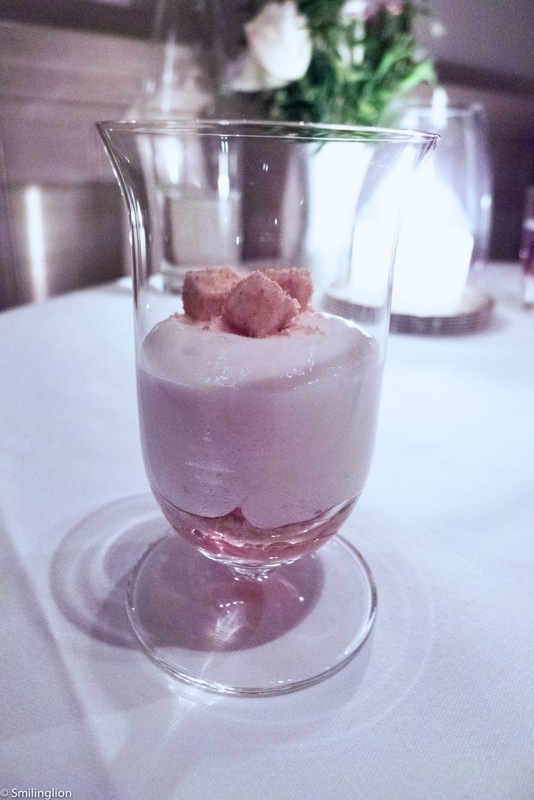 It's so nice to see a French Laundry review from a blog I already know and love! I REALLY need some lobster with onion rings now. 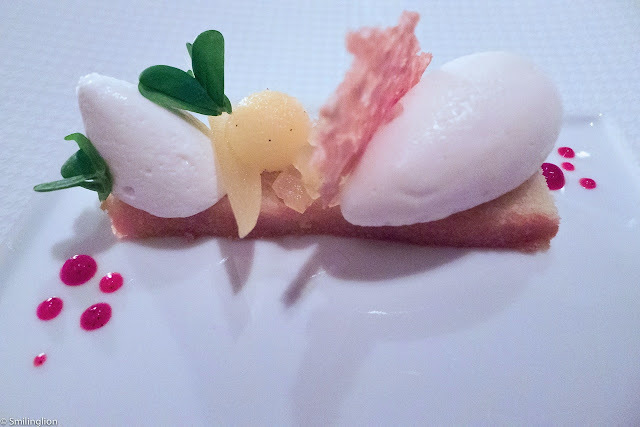 I like Your french laundry Blog. This article help me. Thank your for sharing.